The situation: there are 7.5 billion humans on the planet today. To get a equilibrium with nature having about 4 billion in land based cities is the planetary maximum. The 5 billion "rest" needs to solve their housing and other needs in the only space that is left and available - the oceans - within the next 3 decades. Sea level rise and coastal cities running out of development space will only accelerate this tendency. This means that the equivalent of 780.000 Empire state buildings needs to be built at sea. 26.000 Empire State Building per year…every year…in the next 30 years. That makes more than 70 Empire State Buildings per DAY !!! 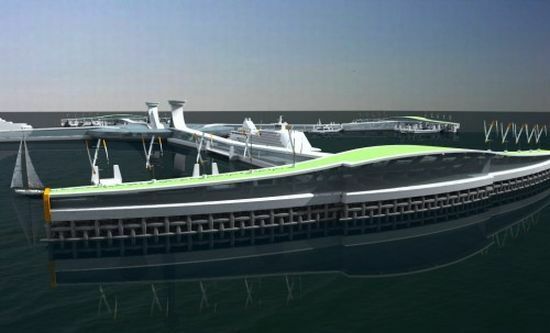 to build on the ocean during the next 30 years just to keep up with the demand. The Empire State Building holds 257.211 real estate square-meters on 102 floors and can host 6430 people in 40 squarmeter apartments. Any architect and real estate investor who is not looking into large scale oceanic real estate development by now, will look like a Neanderthal in a few years. Not convinced?... 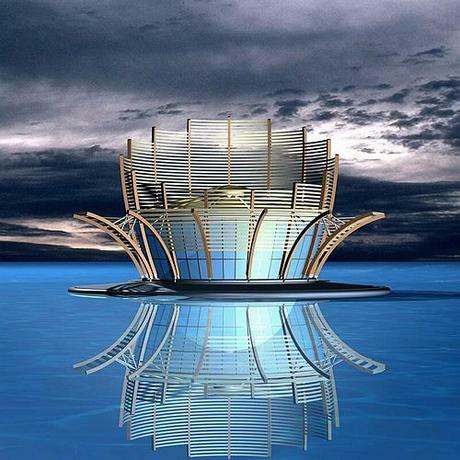 hear little talk about oceanic real estate?... Remember Internet ? nobody "saw it comming" nobody was "planning for it" - looks so obvious now ... - is dominating everything... we live in the 40 years where humanity is struck by wave after wave of groundbreaking technological change - faster than anybody can imagine it - ocean colonization is the next big thing to come. Any real estate agent can understand that business, any investor and any bank can understand it. It looks feasible and desireable business in any business plan. This is why we should not go with "complicated turnkey concepts" but simply try to establish a fabrication site for "floating real estate squaremeters". Creating oceanfront real estate by building sandbanks is a fairly common and well understood business that is going off on large scale in Dubai, Singapore, and other locations. It is a central paradigm of the real estate business that space can not be created but is limited - especially oceanfront space. 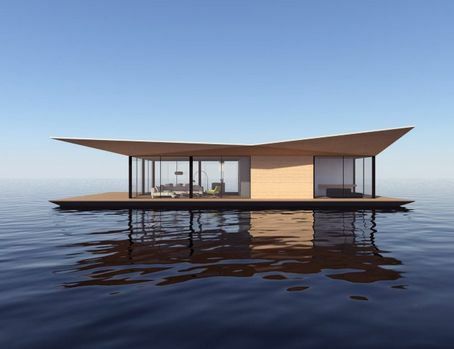 Concrete float solutions expand the sellable real estate to the water - this should be a desireable business field for investors that normally have no affinity to "boating" of any kind. 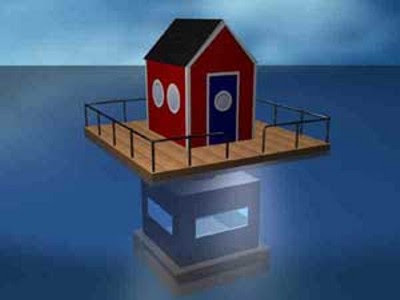 So to start with i would just sistematicly mass produce floating "empty building lots on the water" and offer them for sale. This is a simple deal, with a never ending pool of possible customers, easy handle for established real estate businesses. 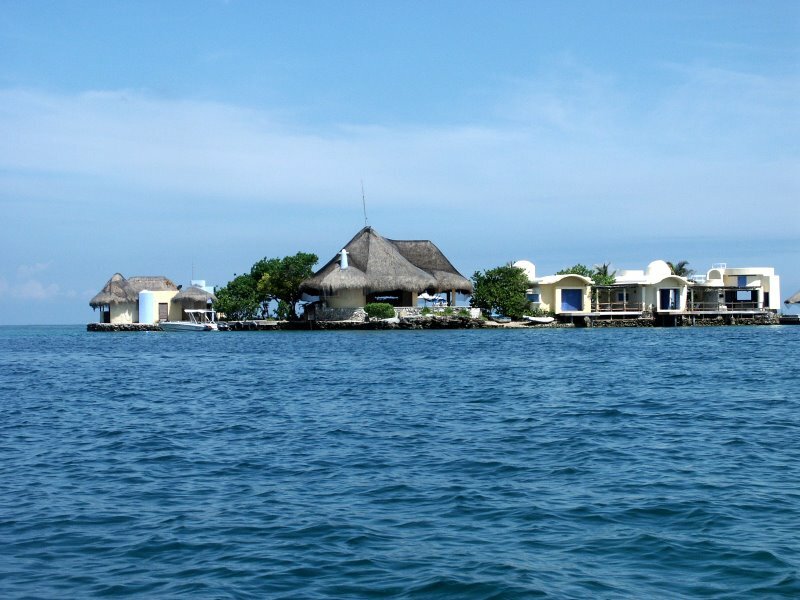 The bay of cartagena for example is a hurricane free water space that is completly open for that kind of developments. A wide and empty protected waterspace surrounded by skyscrappers (some built by donald trump) - ready to do business. 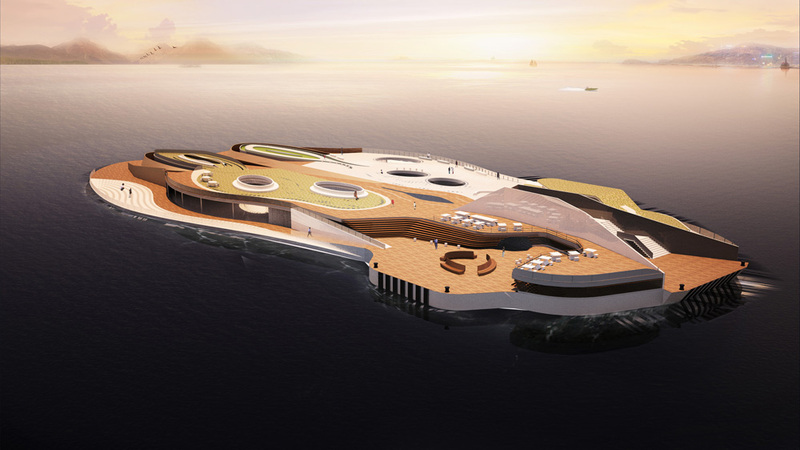 My current development budget for floating installations in cartagena is limited to USD 5000/month. As you have seen on the pictures i can only crank out a few experimental squaremeters of floating real estate in small scale pilot projects in this finance frame. 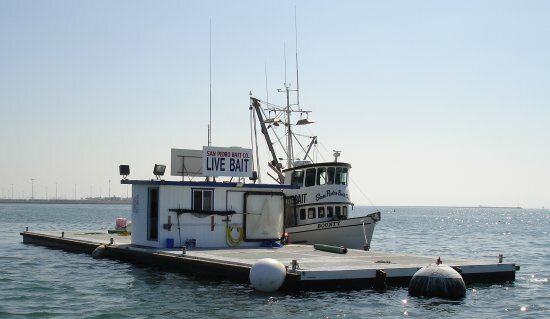 It is of essence for the "guts understanding of the business" that buyers can step on their "empty building lot" and understand that this is not a kind of "boat" - this is solid real estate ground - ocean view. 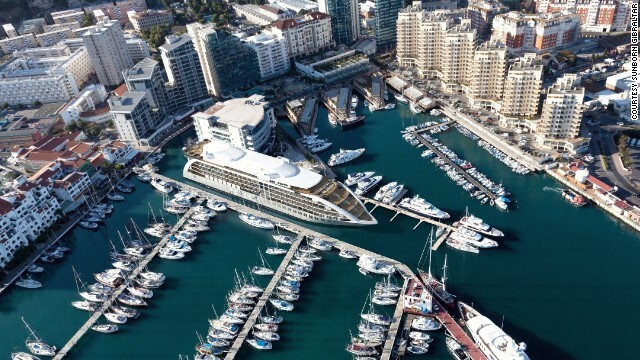 Floating 5 star hotel in Gibraltar - read how cruiseships, marina development, hotel business, and floating real estate development are already merging to one business field. 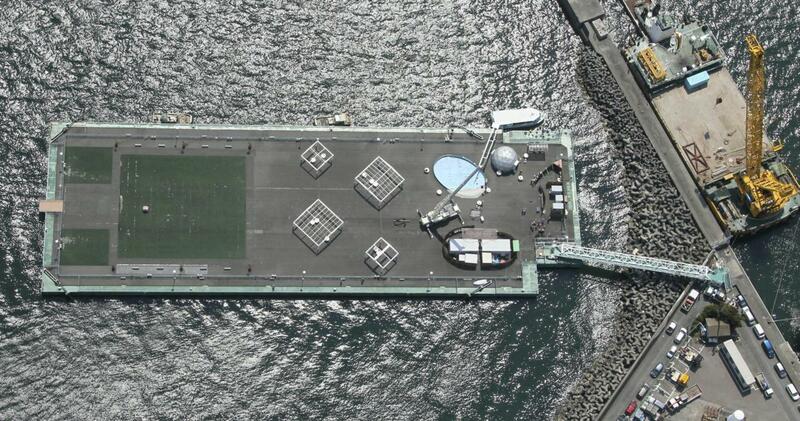 When coastal cities run out of space - floating real estate is the next big thing to come. A floating permanent moored building (shaped as a cruiseship) in Gibraltar blending into a yacht marina ambient. We are living on a water planet, 99% of the living space available is in the water. With a population growth of 1 billion per decade the waterspace needs to be colonized. This is not a "fancy exception" it is a glimps of the "next big thing to come". 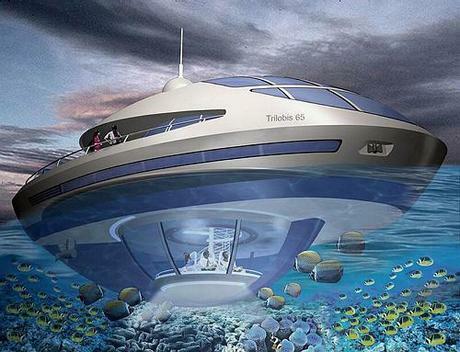 Before mankind is ready to colonize space we need to get ready to colonize the oceans. Concrete has clearly emerged as the most economical and durable material for the building of the vast majority of marine structures. 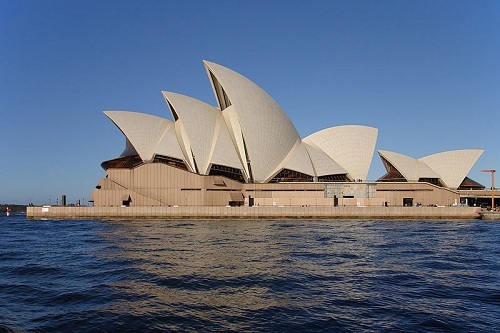 Reinforced concrete too has overcome the technological problems making it a suitable material for the construction of advanced marine structures such as offshore drilling platforms, superspan bridges and undersea tunnels. 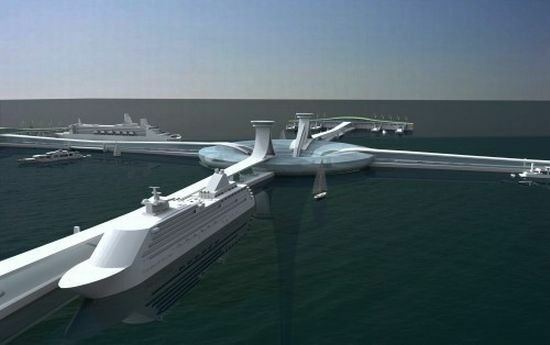 As the world becomes increasingly ocean-oriented for energy and other resources it is predicted that construction activities during the 21st century will be dominated by concrete sea structures. The performance of concrete in the marine environment is presented here in a logical manner giving state-of-the-art reviews of the nature of the marine environment, the composition and properties of concrete, history of concrete performance in seawater, major causes of deterioration of concrete in the marine environment, selection of materials and mix proportioning for durable concrete, recommended concrete practice and repair of deteriorated marine structures. 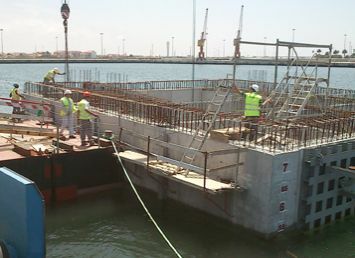 It is of value to any design or construction engineer responsible for marine structures. This is how 99% of the “space volume available to human activity” looks like. In 30 years from now we have 9 billion people – land based resources on the continents can only sustain some 4 billion of them. The “rest” of 5 billion need to cover their nutrition needs, their housing needs, and the production needs for their laptops and consumer goods entirely in this “currently not touched space”. Sounds strange ? it is inevitable. Skyline Cartagena Colombia, one picture says it all, emerging tiger nation port cities running out of development space. The future of business, the future of freedom, who is NOT looking into ocean colonization right now, will look like a Neandertal in a few years. 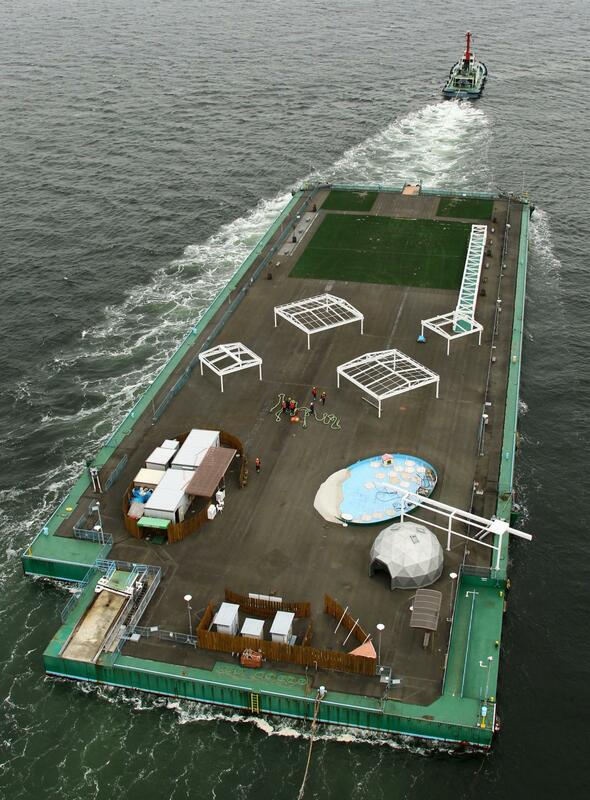 The floating structures on the pictures below will probably go as a "floating dock" or as a "barge". When the lots grow bigger it will probably go as "waterfront development", or "harbor development". 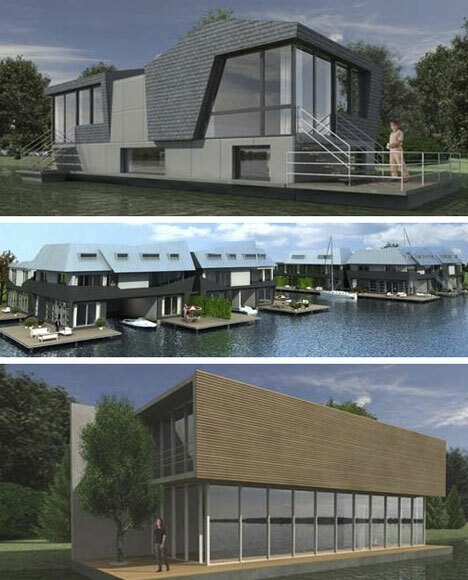 The good thing about real estate developments on floating concrete rafts is that in most countries you will enjoy a extremly high degree of third party interference freedom. 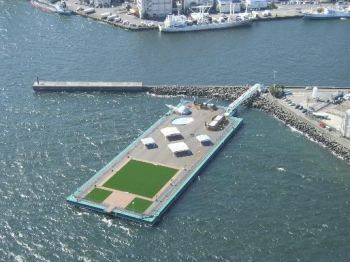 For historical reasons the waterfront is the place where "Land based legislation" like city development plans, and zones, building restrictions of all kind end. You then have a kind of "Marine Authority" in most countries that regulates everything what happens on the water - so they focus on ships and boats, shipping channels and harbor operations. If you think it trough a floating concrete honeycomb structure is kind of "out of jurisdiction" for both entities - it is not a building in the city center - although it might float very near to the city center - and it is not a ship either - this opens opportunities for getting done major projects with a minimum interference level if the project management plays its cards well. The reason why building a hotel or a marina development, directly on the shoreside, is very restricted, is that the project owner wants his hotel right there on a beautiful beach in a pristine lagoon - but the public wants the beaches for public access and the nature undisturbed. 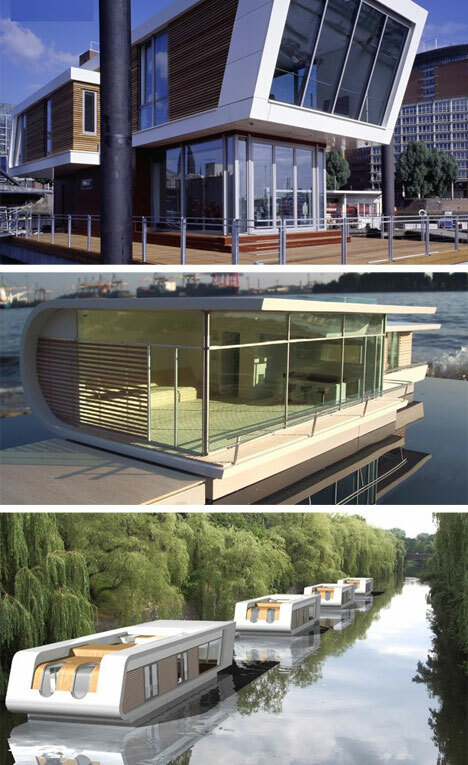 Floating concrete honeycomb and shell structures allow to settle both interests in a non-conflicting manner. The beach stays untouched and free for public access and no heavy machinery has to dig the fundaments of a new mega hotel into the mangrove and coral zones - floating fundamentation allows to keep the environmental impact of the construction cero. Floating building lots on the water, industrial, military, civil engineering, tourism - there are more things to do on the water than shipping and boating - we live on a waterplanet. A small bait barge for touristic supply bait and beer...very small scale motor home sized - and already a water based business platform that makes a living for the owner. 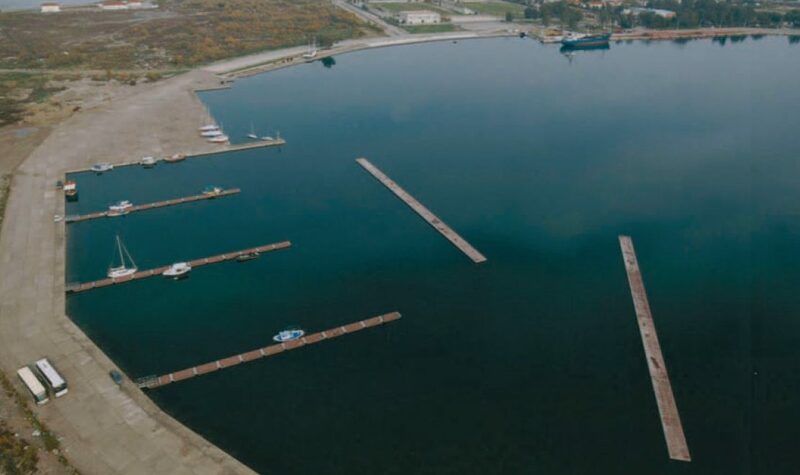 ONE of the world's biggest brewers may build large floating breweries to respond to the industry's future water and energy needs. There are oil platforms, factory ships and cruise ships so large they are more like floating towns - and now SABMiller is looking into the concept of ship-borne breweries amid predictions that water and energy, both key to beer production, will become increasingly scarce commodities over the next 20 years. SAB Miller, which owns such brands as Pilsner Urquell, Grolsch and Peroni Nastro Azzurro,has invested heavily in making its breweries more efficient due to the size and scale of its existing operations. Andy Wales, SABMiller's group head of sustainable development, said that the group's water consumption of 4.7 litres per litre of beer was lower than the industry average of five litres, but it was targeting a cut to 3 and a half litres by 2015. A recent study, part-funded by SABMiller, found that there could be a potential shortfall of 40 per cent in water resources available across the world by 2030. The brewer has also teamed up with the WWF, the environmental organisation, and GTZ, a German government agency, to establish the Water Futures partnership to promote private sector action on sustainable management of water resources and the sharing of the lessons learnt. The concept of a floating brewery has been put forward by Innovia Technology, a consultancy working with SABMiller, as part of a project to predict how a range of different scenarios in terms of the cost and availability of water and energy will affect the technology required to carry on brewing in 2030. Rob Wilkinson, director of Innovia, said: "It would provide flexibility in positioning and length of stay and allow SABMiller to move with water sources, with people, with crops, or even away from severe weather, natural disasters or political instability." Maurice Egan, SABMiller's group head of manufacturing said: "The business case behind the thinking is very serious ." The monaco breakwater in construction in Algeciras drydock Spain - it was towed from Spain to Monaco and contains a parkhouse a shopping mall and several buiildings - it is big enough to allow the docking of 4 cruiseships and protects the entrance of Monaco harbor from waves hinged to land in jetty mode. Ocean colonization will take what is there and prooven right now - and will take it just a step further... the companies and developers that dominate the core technology will have the pole position in the race for this new frontier - in the same way as the railroad company dominated the conquest of the west on the american continent and ships and the East India Company dominated trade in the 18th century. 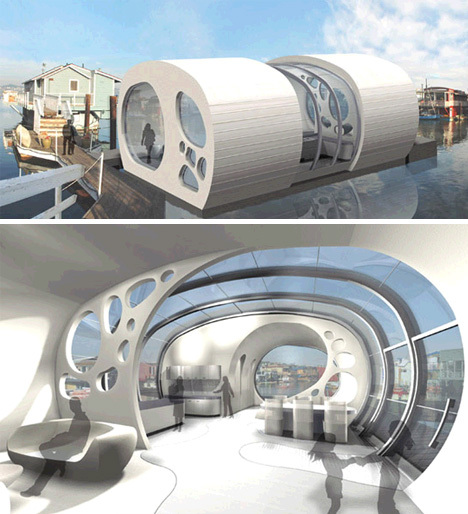 Individual concrete honeycomb shells raft up to a water settlement, very close to a Yacht concept. But also fundamentally different, when done in light concrete shell building ( http://concretesubmarine.activeboard.com/t57819473/floating-concrete-platforms-building-methods/ ) the cost per real estate squaremeter around USD 200/ squaremeter, luxury yachting has a "compareable offer" for USD 23.000 per real estate squaremeter on the market. .The dilemma of building something in "nature reserve areas". Santa Cruz del Islote - called the most densly populated spot on earth by its inhabitants - points out the general business case for building lots on the water. Situated in the San Bernardo Archipelago it developed from a semi permanent fishing outpost on a coral rock into a village when the fishermens families started to grow. Altough there is a big island in the background - people can not live there. The law does not allow to damage the mangroves, nor the corals nor building permantent fundamentation in the beach. Unfortunatly the Archipelago is a coral / mangrove ambient - so what is not coral is beach, what is not beach is mangroves. There is litterally CERO land for construction or settlement. This leaves construcction on floating concrete platforms as only way how you can build something and still not touch the corals, the sand, and the mangroves. The "no space left dilemma" is a ancient one - Venice suffered it in ancient times and solved it by putting houses on pilots in the swamp - a temporary solution - as the whole city is sinking into the soft ground due to the weight of the buildings - floating concrete structures as developed in the last 30 years for north sea oil structures have a maintenance free service life of over 200 years - this makes them suitable for permanent building on the water. 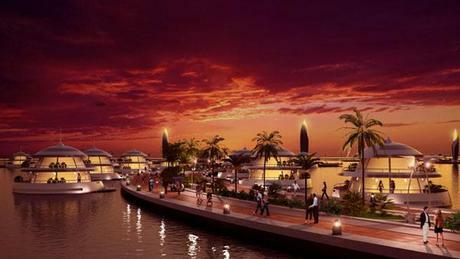 ... modern venice is still to build - floating marinas and Palm Dubai point the way into the future. 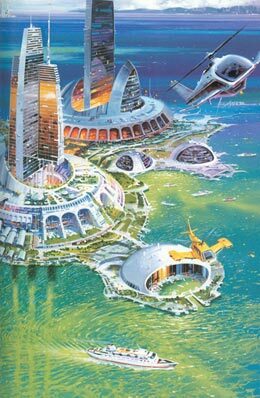 The companies that develop the core technology (floating concrete shell and honeycomb structures) will dominate ocean colonization - mankinds next frontier... before colonizing space. Who dominates the oceanic trade routs and ports - holds the pole position just as Venice did in ancient times. 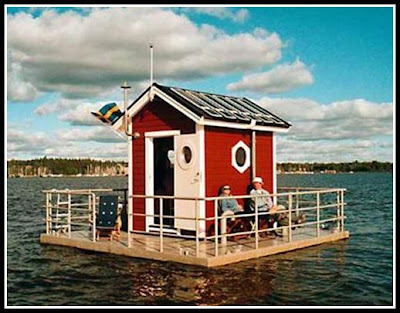 Floating saunas are already a common sight on the lakes of Scandinavia but Swedish company Nordic Marine Living has created a sauna which allows guests to bathe in steam whist watching the fishes glide by. 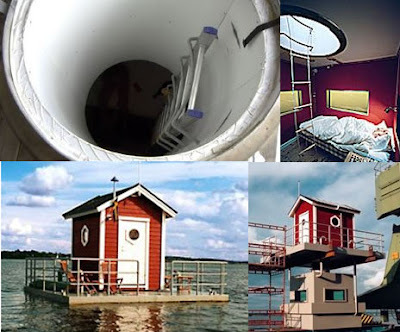 The ingenious invention has a floating platform with a hut on top, and a sauna capsule below. Power floodlights illuminate the depths allowing a most dreamlike sauna experience. Utter Inn 1.750 dólares stay in a submarine hotel room in Västeras Sweden. One of the rarest hotel accomodations in the world. in concrete shell and honeycomb building technology. 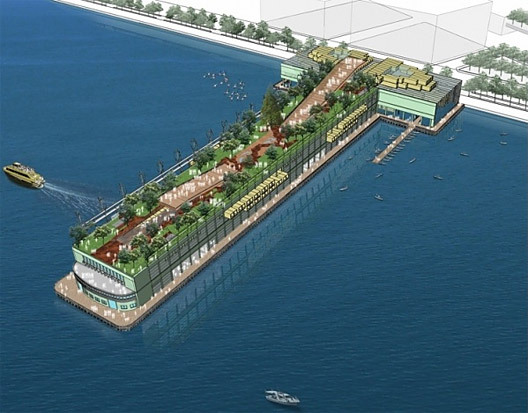 Floating ocean city, sparse connection, protected lagoon waterspaces between the elements - similar to the distribution of Palm Dubai. 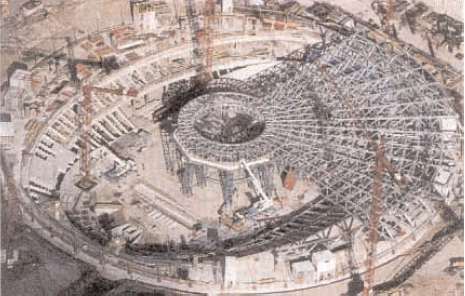 honeycomb structures, shell structures, concrete floating structures. 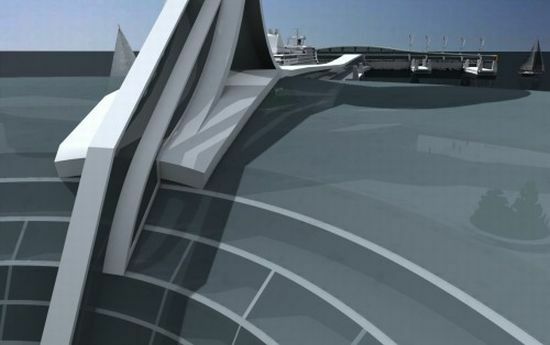 Segments of a underwater tunnel float out - if it were not used as a tunnel it would be a great floating building lot that can carry the structural load of a big building. Building Lots on the water - a city growing from shore out into the water. A similar urban and economic development as VENICE had it in the 16th century - ony that now technology allows floating concrete foundations - out of reach for Venice. 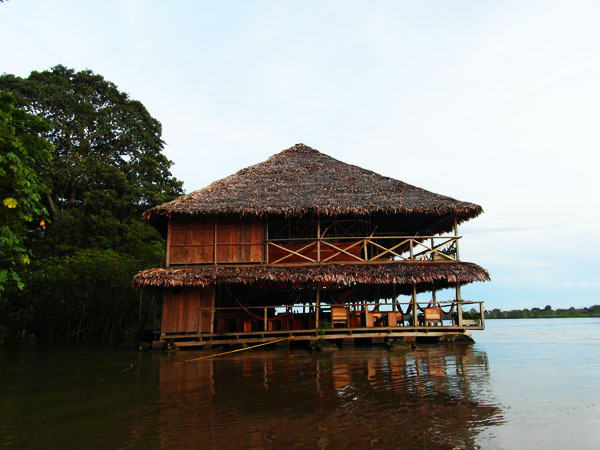 Which was built on wooden pilots in a swamp and lagoon area.